A naturally occurring toxin occasionally found in corn around the world may not be detrimental in beef cattle diets as previously thought. Dr. Jenny Jennings, Texas A&M AgriLife Research beef nutritionist in Amarillo, fed 49 steers a dry, rolled corn-based finishing diet with increasing levels of fumonisin to determine the dangers of mycotoxin in feed corn. The corn used in the study had less than five parts-per-million total dietary fumonisin as a control. The rations included fumonisin rates at 15, 30, 60 and 90 parts-per-million with daily levels averaging between 8.1 parts-per-million to 108.8 parts-per-million for 110 days before harvest. After harvesting and processing, Jennings monitored the marbling score, ribeye, quality, yield grade and livers. The U.S. Food and Drug Administration (FDA) set the amount of fumonisin allowed in corn and beef cattle feed diets in 2001. “The state chemist was using those guidelines as far as the amount allowed in the corn and then allowed in the feed,” Jennings said. No more than 60 parts-per-million of fumonisin are allowed in corn. Cattle feed may have no more than 30-parts-per-million. The research has changed the view of the state chemist’s office. FDA is also reportedly considering the research and may update their guidelines. “There was very limited information. If you read the review published by the FDA, they even say that we had very limited information to work with to set the guidelines,” Jennings said. In the meantime, ranchers and feedlots must continue to follow FDA guidance and guidelines set by the state chemist. 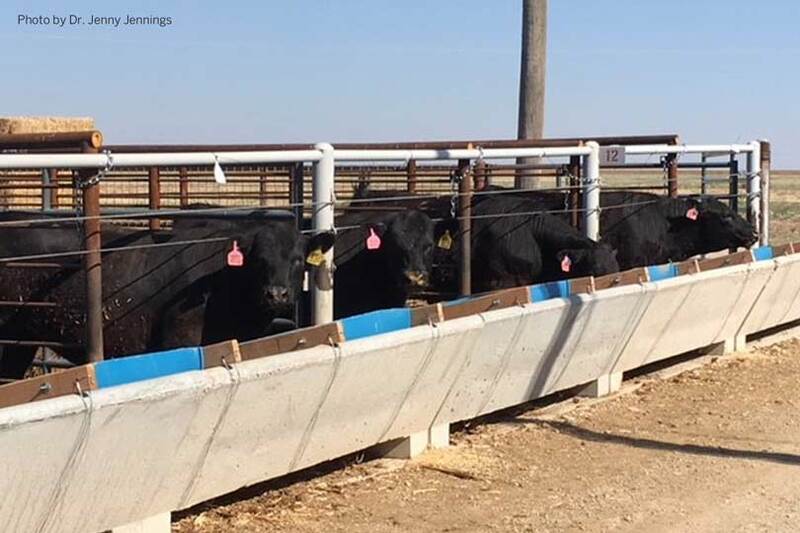 A feedlot owner who asked Jennings if AgriLife Research could find more information on the effects of fumonisin in beef cattle diets inspired the study. Every batch of corn comes in with different levels of fumonisin. Many individuals and organizations came together for the study, including an energy cooperative and nutrition-consulting firms. Another trial may be needed but is currently undetermined at this point. The research is specific to beef cattle. Fumonisin is a toxin produced by fusarium fungi. It’s a type of mold that can grow on corn in specific environmental conditions. Cattle do a good job of filtering fumonisin through the liver and kidneys, according to Jennings, so it’s not deposited into the carcass. The study will not impact regulations on aflatoxin in corn.